Post subject: Down under helmet. Interesting story with numerous flaws. Has anyone seen this or know more about it? Last edited by Sith-Smith on Wed Dec 21, 2016 1:27 am, edited 1 time in total. Post subject: Re: Down under so called ANH helmet. Interesting story! It'll be interesting once they find out the truth. "How Darth Vader's helmet from the original 1977 Star Wars was found in Australia"
Once you get into the article, they make you believe this is one of the original six production made helmets for A New Hope in 1977. "It was an original mould – one of only six crafted for the 1977 film. That childhood treasure – for many years stored and forgotten in a cupboard in Chris' parents' home – was recently valued in excess of $100,000. And there is a bidding war over it." Still. If this helmet ends up being a non-screen used ROTJ production cast for the movie, that's still one phenomenal find. I didn't even know there were six helmets made for Star Wars. Shows how much reading I still have to do. According to Gary Kurtz only three castings were pulled so that's a red flag right there. Additionally the castings were pulled in a white/off white gelcoat so there's that as well (assuming the helmet he's holding hasn't been painted) besides the dome missing the pointed widow's peak. I suppose it could be a production related casting like the TM or GS castings from ESB or RotJ but without better reference it's hard to say. Really makes you wonder just how many Vader helmet casts were pulled from the production molds as mementos for the production crew and friends working on these movies. The article is misleading on facts, but the helmet is intriguing. Be nice to know what expert authenticated it. Truth! It wouldn't surprise me if there were more than a few "back door" copies out there that haven't come to light yet. "Your right story is totally wrong and it is not what I sculpted on a New Hope". Thanks for that. Perhaps this is being confused with the Biba helmets for which there were six production helmets. Things regarding this helmet match more with ESB or RotJ or even tour era helmets from those two movies. There simply isn't any basis to call this one ANH. It appear to be a standard UK Mold lineage cast, which puts it after ANH as it was the screen used ANH helmet that was molded. The article mentions this Elstree employee, Allen Croucher. Can anyone confirm this guy as part of the production department? it be nice to know the real story, since the article is boasting the impossible. Wondering if this is all just a ploy to get publicity for this toy store. Last edited by Sith-Smith on Sun Dec 18, 2016 11:59 pm, edited 1 time in total. I want to feel bad for the person who paid $6,000 for this cast of the original screen used ANH Vader helmet, but then again... maybe not. OMG, someone finally bought that thing?!! Wooow, I wonder if they actually paid? 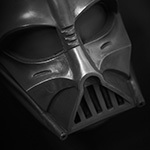 I'm a Aussie & TM owner & like you have obsessed over the minute detail of vaders costume, like you love this stuff! After talking to the man who has possession of the helmet, and listening to him describe it, I believe he has an original esb pre-production casting, and is a brother of the TM. I have been offer an opportunity to view it & compare it to my TM . Can't wait!!!! Will come back with plenty of photos, but he is due to post photos of it on the net soon. No fear. In all of this I will pay full respect for the wishes & agreements entered into with tom.